Improve Downswing Sequence, Posture and Hip Rotation for More Consistent Ball-Striking. Correct sequence, as well as proper hip rotation while maintaining posture on the backswing and downswing are essential to hitting solid golf shots consistently. The Total Golf Trainer - Hip is a simple device that provides visual and tactical feedback ensuring that your hips are in the proper position (with the proper sequencing of events) throughout the golf swing. The Total Golf Trainer - TGT Hip works by providing instant feedback. If you lose your posture, slide your hips too much (instead of rotating), or cast the club from the top without clearing your hips first and getting the club into the slot, the TGT - Hip will let you know! Easy to use and adjustable. Increase and decrease the difficulty for use by level of golfers. Simply attach the device to your belt or waistband, watch our instructional videos (included with your purchase), and start using. If you lose your posture, slide your hips, or reverse pivot, you’ll feel body contact with the red indicator ball, alerting you of your fault. The Total Golf Trainer - Hip will allow you to feel the proper sequence in the downswing to ensure the club approaches the ball from the inside, creating dynamic shaft lean at impact, and feeling your arms extend through the shot for increased power and accuracy. The TGT Hip teaches how to control your hip turn in the backswing, sequence the downswing and learn to rotate the hips through impact. The training rod ensures your hips and core are positioned correctly in order to generate maximum power and clubhead speed. Some of our customers even wear two at the same time to ensure they achieve hip turn and load in the backswing while sequencing and rotating in the downswing. The Total Golf Trainer - Hip is ideal for anyone wanting to learn how to use their hips properly in the golf swing to create power, sequence the downswing, rotate the hips and achieve a perfect impact position. 1)Attaching the TGT Hip to your lead hip(belt,pants,skirt ect) at 90degrees to the target line. The Takeaway- the red ball on the training rod will give you a visual for hip turn and load into the backswing. Top of Backswing- the red ball will provide a visual indicator for amount of hip turn and lower body load into the trail leg. Downswing- the TGT Hip will provide physical feedback for correct hip rotation and posture. *setting the training rod depends on how difficult you want to make the backswing and transition. The Takeaway (Training rod parallel to the target line)- take the club away on plane, parallel to the training rod at waist high. Downswing/Transition-The training rod will provide instant feedback to improve downswing transition creating more speed and a dynamic impact. Attaching the device towards your back pocket will lesson the difficulty, while moving device towards front pocket increases difficulty. Done correctly the arms and club get back in front of the body with NO contact to the training rod. Finish and Posture- Rotate the hips and body, facing the target in the finish. This setting has the training rod on the Lead hip 90 degrees to the target line. The TGT on the Trail Hip parallel to the target line. The dual hip setting provides safe correct feedback doing practice(eliminating the alignment stick through the belt loop) The lead Hip 90degrees to the target gives feedback on turning and rotating the hips, loading up the backswing and clearing the hips on the downswing, while the trail Hip setting parallel to the target provides feedback in the takeaway and downswing transition. This combination brings real feel and real results. The TGT Hip reinforces correct takeaway, hip turn and load in the backswing, downswing sequencing for an optimal impact position. The correct hip rotation and sequence will deliver a more powerful and consistent strike every time. 1)Posture: is essential to any good swing. The Red indicator ball on the TGT Hip provides correct posture and gets instant feedback if your posture changes throughout the swing. 2)Takeaway: The takeaway will ingrain the proper feel for staying on plane and creating optimal width in the backswing. 3)Downswing Transition is one of the most difficult parts of the swing to learn. The TGT Hip gives golfers the feedback to create a consistent, powerful and repetitive downswing transition. 4)Correct DownswingSequencing for an optimal impact position. The correct hip rotation and sequence will deliver a more powerful and consistent strike every time. 5)Extension a key fundamental for power and consistency. The TGT Hip provides instant feedback so you can learn how to release the body and club powerfully for maximum accuracy and distance. 1)Loss of Posture during the backswing or on the downswing causes all kinds of wild shots. The TGT Hip (with its yellow indicator ball) will show you how to maintain correct posture throughout the swing. 2)Sliding of the Hips is a common problem that affects many other faults. The TGT Hip will give you the visual reinforcement needed to learn the correct body rotation in your swing and avoid the dreaded hip slide. 3)The Reverse Pivot is a common fault that is difficult to recognize for golfers. The TGT Hip teaches you the correct position of the upper body whether you want to load in your trail leg, or stack and tilt. 4)Early Extension caused by the hips coming in and towards the ball is a deadly swing fault. 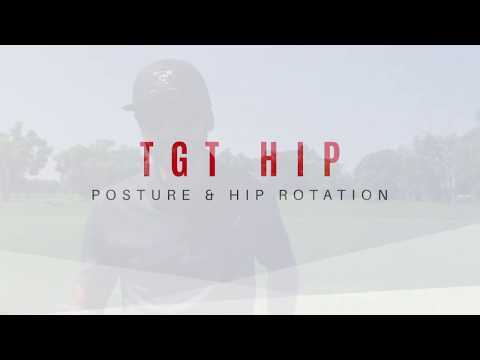 The TGT Hip will help you experience the feel of correct rotation and eliminate your early release. 5) Hang Back is a common fault that makes it impossible to hit solid shots consistently. The TGT Hip will give you feedback using the yellow indicator ball to evaluate your finish position for more powerful, consistent contact. Get all the feedback I need! I have always needed video for feedback, now I use the TGT Hip and get all the feedback I need. Could'nt be happier with my purchase! I liked the hip trainer so much, I bought two and wear them both at the same time - one on each hip. Keeps my alignment and rotation through my swing. The TGT product line has given me all the tools I need to improve and make it as a professional. If you're looking to lower your score start using DaVinci Golf products today!